Is not this a hoot? Yeah, me and old Zhang think it is a hoot. "Self-starters" normally don't need a teacher. They know how to ask their questions and go about finding their answers. "Self-starters" normally don't care too much about other peoples opinions. I know, this is a generalized statement, but I think it applies to this discussion as well. Rule number one: Don't drink mercury. Yes. Absolutely not. Because this what happens to you if you do. So I would take "mercury" in the taoist texts just as a metaphor for a "feeling" of strength, cohesion and fluidity which is difficult to describe otherwise if you never experienced in your body or others. To produce liquid mercury (quicksilver), crushed cinnabar ore is roasted in rotary furnaces. Pure mercury separates from sulfur in this process and easily evaporates. A condensing column is used to collect the liquid metal, which is most often shipped in iron flasks. Cinnabar or Dan is the ore of mercury, is actually a sulfide. If you heat up the mercury sulfide in a cauldron the reaction occurs and the sulfury becomes sulfury oxide and the mercury condensate into metallic drops. Hence the idea of a "cauldron" in the body which should be in the belly button area and a "firing process" to melt the "cinnabar" into "mercury". The question is what is "cinnabar" and what is "mercury". These are metaphors for "feelings" which are basically hormones produced in your body organs. Some hormones and neurotransmitters produce certain "feelings" and each has its own schedule of production coming into use and then burned out and eliminated as a waste product. Hence the idea of a "circuit", recycling and preservation of substances in your body without the need to waste them. Of course many hormones especially the sexual hormones have cycles synchronized with the moon phases. Thanks for the vid Andrei, i was meaning to do some research on it for some time. In waidan mercury is literally that, as is in ayurveda. So rhetorical that transmission is ultimately needed? Ever translate the pic? that would be awesome to share. Interestingly, there's a lot more minerals, including very toxic ones, used in Ayurveda than in traditional Chinese medicine, and a lot fewer animals and animal parts. In Chinese medicine, however, very toxic substances are used too, usually as the last resort, when all else fails. In taoist alchemy, a similar approach exists in both waidan and neidan -- to wit, very drastic interventions are used when necessary, not used when a safer course is available. Neidan is not "safe" and waidan is not "unsafe" by themselves -- it all depends... A transmission is neither a safe nor an unsafe method. It is something inherited from the shamanic tradition where the new shaman had to have prepared herself and to have been chosen by the spirit realm to receive it, or else it might even kill her. On the other hand, someone chosen for the task couldn't safely refuse it either. 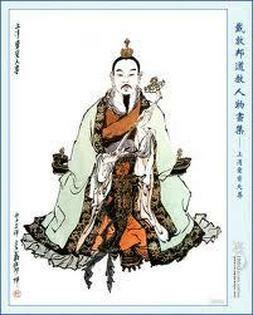 Most true taoist transmissions are, generally, of the same kind. new shaman had to have prepared herself and to have been chosen by the spirit realm to receive it, or else it might even kill her. On the other hand, someone chosen for the task couldn't safely refuse it either. Most true taoist transmissions are, generally, of the same kind. Not really, but the black and white circles surrounding the practitioner are tagged with trigrams and stems. The caption above says: the external medicine taking diagram. Top right : brightness of the sky above divided into 12 hours. Bottom right : the refinement among men is divided into cinnabar stages(?). Bottom left: w/o understanding the dark spring - the medicine is not complete. Top left: if words leak for a moment - no reliance, sincerity(?). 1. Neidan is difficult to comprehend on your own from the other books. 2. But you can totally comprehend it from this book. 3. Once you comprehend it from this book - do not disclose lightly. The neidaneers quote the first sentence to prove that nobody can comprehend neidan from any and all books (being either lazy or illiterate to get to the second one). Then you show them the second one, and booom, they are hoisted by their own petard. Thats why this quoting one-upmanship game is such a hoot. There is this question, variously worded as ‘what is the relationship between Bagua and alchemy’ or ‘explain houtian Bagua sequence as related to taoist alchemy practice’, or any such random combination thereof. It also has a certain mechanic undertone to it, sounding as if it came from a random word generator, then processed through the googletranslate system. It is asked with an ill intent of arrogantly pretending to ‘check’ an opponent’s level of practice, then, regardless of the answer , declaring the answer wrong and the opponent inferior. In case of the opponent not dignifying it with an answer the opponent is declared ignorant. Is not it quite a trap here? Well, it is not. This ignorant question is rather a petard of the ignorant interrogator’s own making, on which he hoists himself nice and easy. 故上品丹法，不用卦爻也。The highest elixir method does not employ bagua. 说与学人，火无斤两，候无卦爻。In fire there are no weights, in phases there is no bagua. Is there in Taoist alchemy an equivalent to the "dark work" of western alchemy, a terrifying and painful purification as the starting point of the process? The question is for anyone who wants to answer it. Thanks. Yes, there is. it is called 'building the foundation'. There are two kinds of dan dao. The lately dan dao use breathe to build Mco. This way hurt a lot and very dangerous. I know many Chinese hurt body by Mco. One of friends even emptysis. The early dan dao don't do that. Want to elaborate on that? Thanks. Melting self is melting kalpic roots of worldly sensory perception, melting the own nature of personal characteristics, removing completely the learned polluting guest qi. It also an effort to rein in anger and to subdue desires, to vanquish self and to come back to ritual. To rein in anger and to subdue desires, to vanquish self and come back to propriety means that there should not be no thoughts nor worries, no movement and no swaying, the root and trunk should be strong and firm. Similarly to building a house, for which first a foundation is tamped down, the base ground must be firm, to sustain any load of wood and bricks from which the house will be built. Now, melting self is tamping the foundation down inside, it is not some kind of melting self that takes place on the outside. removing completely the learned polluting guest qi. can you explain this more ? Thank you very much for your answer. If you have the good will and patience please let me know if in Taoist alchemical literature one starts that work voluntarily or on the other hand gets caught in it due to karmic causes as somehow taomeow was suggesting. Sure. The wording is 与夫一切习染客气. The "guest qi" is the karmic conditioning acquired in the course of the previous countless rebirths, plus the societal training in the current lifetime. Combined, they create a faux persona, consisting of learned likes and dislikes, which drags down the "host qi" (the real person of an individual) back into samsara. In the real Quanzhen they used various harsh ways to get rid of it. One hagiography further tells us that during the few days before his death,Wang Zhe subjected his top disciple, Ma Yu, to a very strange torture. One day he bought four carp at the market, brought them back to the inn, and boiled them in a pot of water together with two jin (approximately 1 kg.) of mutton. He left the stew to sit and spoil for over a month. He then brought the stew out before all of his disciples and followers and ordered them to eat it. Everybody refused, on the grounds that they were obeying the precept against the eating of meat and fish. For the next several days,Wang Zhe made Ma Yu eat the stew for breakfast, after which he would send him off to the market to buy liquor and steamed honey-jujube treats, which Wang Zhe himself indulged in. Ma Yu failed to understand, and Wang Zhe would become even stricter. ... if in Taoist alchemical literature one starts that work voluntarily or on the other hand gets caught in it due to karmic causes as somehow taomeow was suggesting. This is a great question. Also a complicated one. A proper answer to it is predicated on the fundamental difference between the chinese and the western worldviews: there is no free will in the chinese one. As far as the chinese are concerned everything was fixed at the beginning of times when the first people began to cycle through the wheel of rebirths. For no reason some of them were born good, some of them were born sinful. That was just the way the cookie crumbled. When the mid-life crisis strikes, as it did Dante, the good ones start the work, because they were programmed to do so by the whole previous karma not because they have a free will to make a voluntary choice. Because starting the work involves disrupting the commonsensical way of life, to the observers, and even to the person himself, the person looks possessed, crazy or just going through the mid-life crisis, all of which are not voluntary reasons. Much as I thought. Thank you for the confirmation Taoist Texts.